Are you a fan of the Puritan Paperbacks series from Banner of Truth? These wonderful Puritan books should be in every Christian’s library. They represent some of the most learned, godly and practical of preachers and theologians including Brooks, Owen, Bunyan, Watson, Burroughs, Baxter, Sibbs, Trail, Bolton, Flavel, Bridges, Perkins and Venning. They are simply gold. Read them and pass them along! 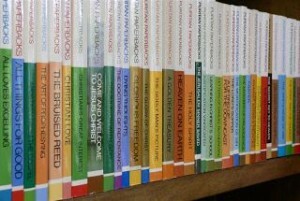 Because of my love of the Puritans and particularly this series, I’ve created PuritanPaperbacks.com. This site contains links to every book, an extensive collection of quotes from the books, biographical sketches of the authors – and eventually will have video book reviews, sample readings, etc. Be sure to check it out.